Made by the standard 1/4″ screw thraed,it supports most photo equipment such as reflector,softbox,different lights,umbrella and background,etc.Note:Light stand only,Other items are NOT included. Note:Light stand only,Other items are NOT included. Constructed from aluminum alloy,giving it exceptional strength for heavy duty work. 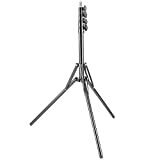 This high quality light stand is the perfect item for the professional studio. It is also of light weight and can be folded into a small size,making it portable and easy to store after use. It can be used with reflectors,boom stands,continuous lights,strobe flash lights and backgrounds. This entry was posted in Discount Photography and tagged 59/150cm, Alloy, Aluminum, Backgrounds, Flash, Light, LightsRing, LightUmbrellas, Neewer, Photography, RelfectorsSoftboxesLED, Stand by Ball Photo. Bookmark the permalink.